Are you sleeping well? Bouncing out of bed in the mornings feeling peaceful, relaxed, and refreshed? If you're not sleeping well - what are the best ways to bring back a good night's sleep? In my 15+yrs' clinical experience - Sleep is one of the the biggest GAMECHANGER! Not only for your Health - but to enjoy the mental, emotional, and spiritual Clarity to create the life you LOVE. Humans are the only animals that chronically sleep deprive ourselves? The profoundly different physiology across all systems (hormonal, cardiovascular, immune, digestion, detox, and more...) -- when we sleep enough, vs. when we're sleep deprived? How sleep influences our learning & memory in powerful ways? Sleep deprivation can change our brain states to mimic Psychotic patients? :-o Is that why we feel irritable when we don't sleep? How Liver Detox, Growth Hormones, Tissue Repair, Blood Pressure, Blood Sugar - and many more physiological markers are elegantly synchronized to your sleep? Join us for this uplifting & empowering 1-hour. 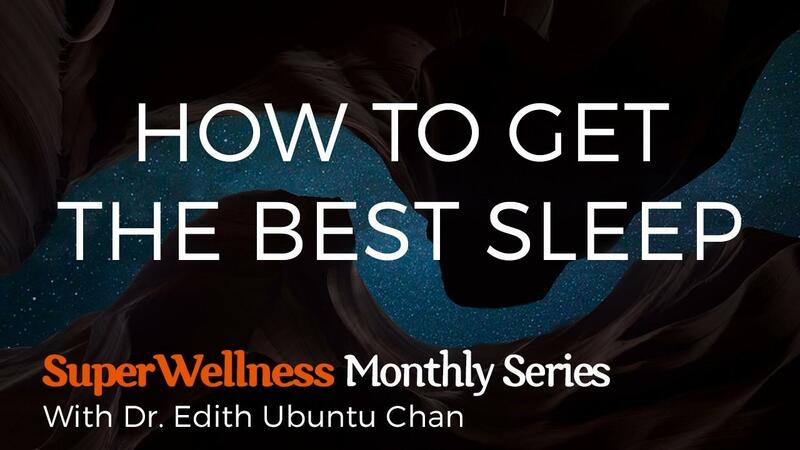 Learn how to get the BEST SLEEP. It may change your life and your health - forever. This webinar is for entertainment & educational purposes only. It is NOT intended to diagnose or treat any medical conditions. Within the context of this webinar, Dr. Edith Ubuntu Chan is serving as educational speaker - and NOT as your medical provider. Always consult your doctor in a timely manner for any medical concerns. Never change or discontinue any doctor prescribed medical treatment without consulting your doctor first. In this webinar, any comments made by Dr. Edith Ubuntu Chan or any other participants are NOT to be taken as substitute for individual medical advice. You hereby forever release, waive and discharge any claims against Dr. Edith Ubuntu Chan, The School of Dan Tian Wellness, LLC, & associates. You confirm that you're using this product solely for your personal entertainment or education and take full responsibility for your own action & results.